Public health insurance exchanges (HIX) transform the individual insurance market. HIX customers are actively engaging in the buying process, using both “high-tech” and “high-touch” purchasing channels, and putting health plans on notice that they will switch if they are dissatisfied. Exchanges are opening the door for a new generation of actively engaged consumers. Findings from a 2015 Survey of U.S. Health Care Consumers suggest HIX customers differ from those with other insurance coverages. 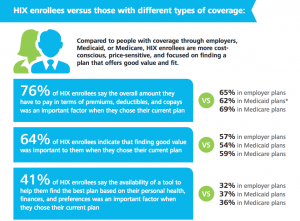 More cost-conscious, price-sensitive, and focused on finding a plan that offers good value and fit, HIX customers have a better understanding of plan benefits and costs than individuals with coverage through employers, Medicaid, or Medicare. They are inclined to compare plans, providers, and services on price but show interest in quality measures, too. – Enrollees report getting care they may not have been able to afford without their HIX coverage and are connecting with primary care providers at twice the rate of the uninsured. – However, one in three enrollees with coverage for the entire year had trouble paying their out-of-pocket (OOP) health care expenses. – Eight in ten renewing enrollees stayed with the same insurance carrier, but plan satisfaction is an issue. – Nearly half of renewing enrollees report they switched insurance products, and only 30 percent of all surveyed HIX enrollees say they are satisfied with their current plan, which is significantly lower than other insured cohorts. What is needed to equip this new generation of health care consumers? Survey findings point to multiple purchasing channels, more reliable information sources, better decision support, and further development of online resources and digital technologies. Improvements in these areas may help HIX enrollees become well-informed health insurance purchasers and more fully engaged health care consumers.